Since 1987 UTECO CONTEC has been designing and manufacturing automatic palletising and depalletising systems for every industrial sector. Today, thanks to our experience from many years in the business and our on-going commitment to new technology research and development, we can offer a wide range of machines with increased performance and reliability. UTECO CONTEC was the first company in Italy to develop an automated palletising system for layers containing different-sized packages. 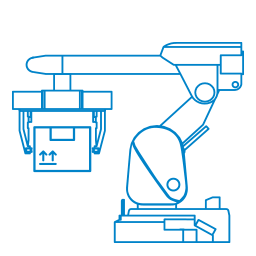 Our software manages the entire palletising system, ensuring that packages are sent to the robot according to a pre-set sequence, applying criteria to put together stable pallets, suitable for automatic handling. All machines are equipped with special gripping units that can handle the most diverse types of products, with single-piece or multi-piece gripping functions (rows or layers).